Input text: it is evening. the sun is black. the ground is texture. the giant bear. the 1st yellow sphere is -26 inches to the right of and -50 inches above the bear. the 2nd yellow sphere is 10 inches under and 20 inches in front of the 1st yellow sphere. it is -20 inches to the right of the bear. the 3rd yellow sphere is above and 35 inches behind the 1st yellow sphere. it is -45 inches to the right of the bear. the 1st red sphere is 15 inches above the 2nd yellow sphere. the 2nd red sphere is 10 inches under the 1st yellow sphere. it is -20 inches to the right of the bear. the 3rd red sphere is behind and 20 inches under the 3rd yellow sphere. it is -20 inches to the right of the bear. the 1st green sphere is 20 inches under and 2 inches in front of the 3rd yellow sphere. it is -23 inches to the right of the bear. the 2nd green sphere is 10 inches above the 1st yellow sphere. it is -37 inches to the right of the bear. the 3rd green sphere is above and in front of the 1st red sphere. it is -30 inches to the right of the bear. the 1st blue sphere is 10 inches above the 3rd red sphere. it is -20 inches to the right of the bear. the 2nd blue sphere is 15 inches under the 2nd yellow sphere. the 3rd blue sphere is 20 inches under and 10 inches behind the 3rd red sphere. it is -20 inches to the right of the bear. the 4th yellow sphere is 30 inches above and 5 inches behind the 3rd blue sphere. it is -15 inches to the right of the bear. the 4th green sphere is 10 inches under and 1 inch in front of the 4th yellow sphere. it is -15 inches to the right of the bear. the 4th red sphere is 17 inches under the 1st green sphere. the 4th blue sphere is 8 inches above and 20 inches in front of the 2nd yellow sphere. the spheres are shiny. the blue light is on the bear. the yellow light is in front of the blue light. the red light is behind the blue light. 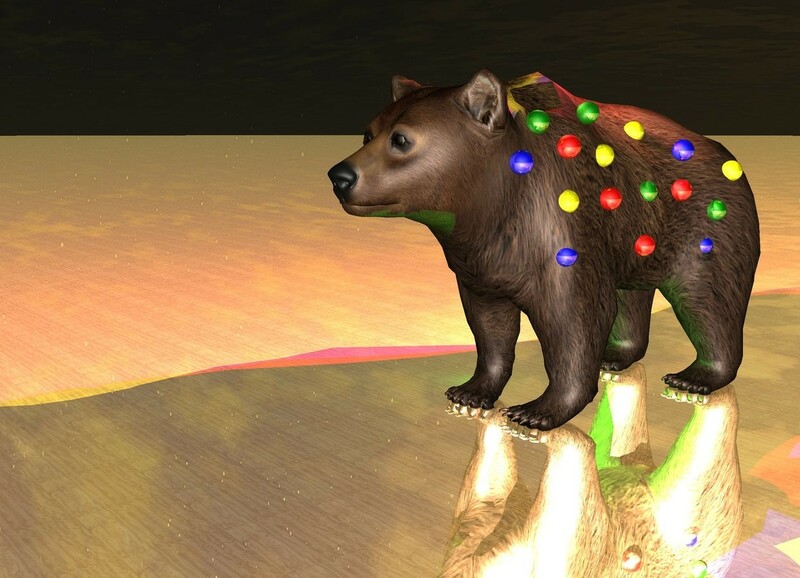 the green light is under the bear. the ground is 300% shiny. who needs a disco ball ?